The Sikh marriage is a very special ceremony in which two individuals are joined in a equal partnership. It is joyous and festive event which is very family orientated and informal in it’s atmosphere. In the Sikh marriage ceremony, Guru Ram Das has given us a formula for a successful marriage in the form of four rounds 0r four concepts. In fact, he describes for us the sacred journey of the soul merging with the infinite. When applied to marriage it results in happiness and fulfillment. Sikh Gurus define marriage as: “They are not husband and wife who only have physical contact; rather they are wife and husband who have one spirit in two bodies.” The fourth Guru, Guru Ramdas Ji, originally composed Lavan, the wedding song, to celebrate a holy union between the human soul (Atma) and God (Parmatma). 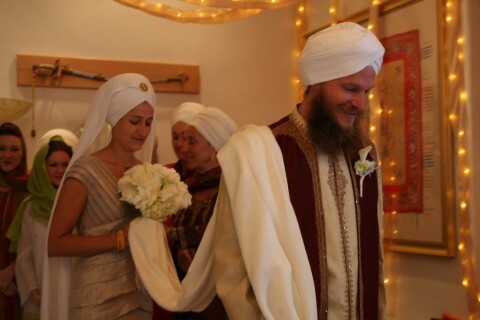 The Sikh man and woman marry to help one another on the spiritual path, surely. Marriage is also a cozy haven of love and joy in this world. However, one’s main support and mainstay is God and in one’s ability to access that Source of Life. The gift to the Sikh is the Siri Guru Granth Sahib. 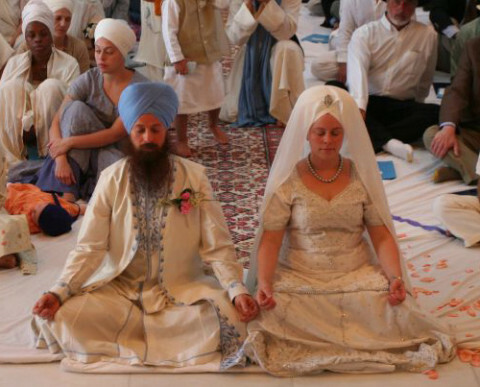 Why does the couple circle the Siri Guru Granth Sahib as they commit to each round? It is not just a ritual. You are making a commitment with the Guru as witness. And as you circle the Siri Guru Granth Sahib you are reminded that the Guru is the center of your life, from which springs your life and the understanding of the journey of the soul crossing this world ocean. The Siri Guru Granth Sahib represents the core of you. The Sadh Sangat is your support system. Anand Karaj, literally, “joyful ceremonial occasion or proceedings” is the name given to the Sikh marriage ceremony. For Sikhs, married status is the norm and the ideal; through it, according to their belief, come the best opportunities for serving God’s purpose and the well being of humanity, and it affords the best means of fulfillment of individuality and attainment of bliss. Sikhism does not repudiate vows of celibacy, renunciation or the sannyasin state, but it does discourage it and advocates marital life as the best way of living. The history of the Anand marriage ceremony is traced back to the time of Guru Amar Das (1479–1574), who composed the long 40-stanza hymn Anand Sahib, in the Ramkali measure, suitable to be sung or recited on all occasions of religious importance. His successor, Guru Ram Das, composed a four-stanza hymn, Lavan, which is recited and sung to solemnize nuptials. During the time of Maharaja Ranjit Singh and his successors, however, this ceremony fell into partial disuse under the renewed Brahmanical influence at court as well as in society. The core of the Anand Karaj (the “blissful ceremony’) is the laavan, wherein shabads (hymns) are sung with the bride and groom circumambulating the Guru Granth Sahib. The ceremony serves to provide the foundational principles towards a successful marriage and also places the marriage within the context of unity with God. Guru Ram Das Ji composed the four stanzas of Lavan to be sung and recited as the core of the Anand Karaj. In 1579, the fifth Guru, Guru Arjan Dev Ji and Mata Ganga were the first couple to be married through the Anand Karaj ceremony. The laava phere (singular laav) are the four hymns of the Anand Karaj (Sikh wedding ceremony) which form the main part of this ceremony. The four hymns are from the Siri Guru Granth Sahib, the Sikh holy scriptures and appear on Ang 773 to 774 of the total of 1430. Guru Ram Das says on Ang 788 of the Siri Guru Granth Sahib of the meaning of marriage to a Sikh couple: “They are not said to be husband and wife who merely sit together. Rather they alone are called husband and wife, who have one soul in two bodies.” The four laava give the Sikh couple spiritual guidance for their life ahead. The Guru tells of the four spiritual stages of married life and how the couple as a team have to first begin by following the path of righteousness and sinless-ness. Secondly to only have fear of the Lord and remove the ego from within the souls; then to remember and sing the Lord’s name with the holy congregation. Finally, the couple will find divine peace; come to accept the Will of the Lord and find unending happiness in the Lord. The main part of the Anand Karaj (Sikh Marriage Ceremony) is the reading and then the singing of each laav in turn. When the Laav is sung, the couple, joined by a piece of cloth, circle the Guru Granth Sahib. This has relevance to the occasion and should not be considered a ritual without meaning. When the couple circle the Guru Granth Sahib each time they are making a commitment to God with the Guru as their spiritual witness and support. And as one circles the Sri Guru Granth Sahib you are reminded that the Guru should be the center of your life, from which springs your spiritual leadership and understanding that you require for your soul’s long journey across this ‘world ocean’. The Sri Guru Granth Sahib is the spiritual center and the Sadh Sangat is your worldly (temporal) witness and support. Remember, mediate and embrace Naam. Only by good fortune, is real peace obtained and Lord seems sweet to the mind. Worship the one Waheguru and all your sins will vanish. Sing God’s praises and feel His presence before you. Speak the Word of the Lord’s Bani. And you will know your future destiny. God’s Will seems sweet to these Gurmukhs. The Souls will blend with Waheguru and only Naam will occupy your heart.